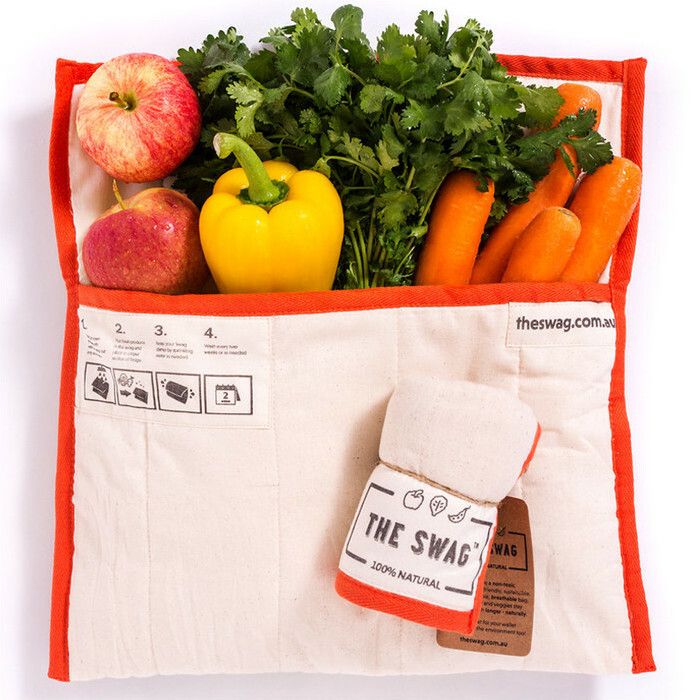 The Swag in the Small size is a new way to keep your fresh produce fresher for longer in your refrigerator. 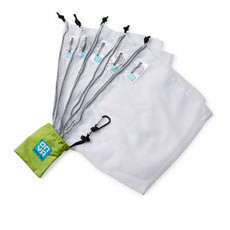 Made of a unique 3-layer patented* design this small cotton bag protects your fruit and veggies from drying out or wilting before you have the time to prepare them. 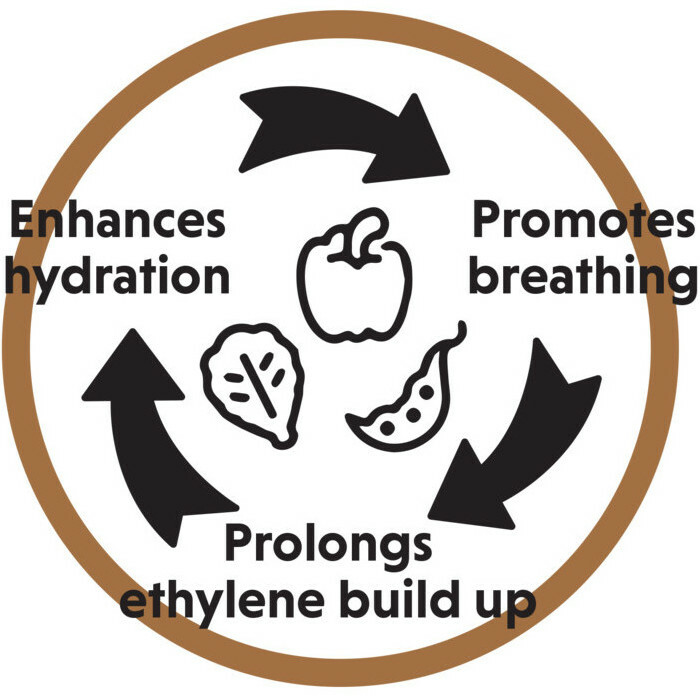 Creating a breathable environment which is moist, not too cold or too hot allows them to thrive in your fridge and last 2-4 times longer than in the crisper. 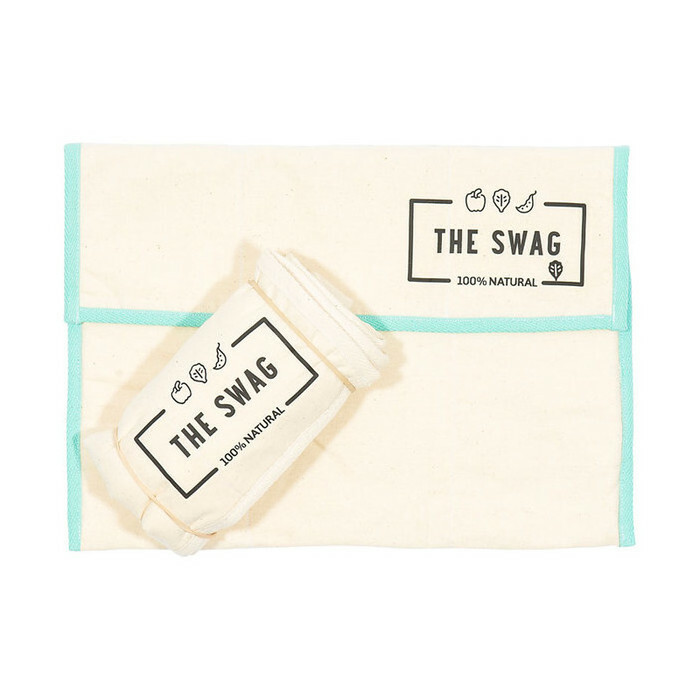 The Swag bags are environmentally friendly, sustainable and easily washed in your machine. 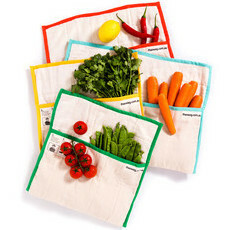 Save money by not throwing anything away at the end of the week, these bags will easily pay for themselves within a week if you are guilty of dumping old tired vegetables away before you managed to use them up. 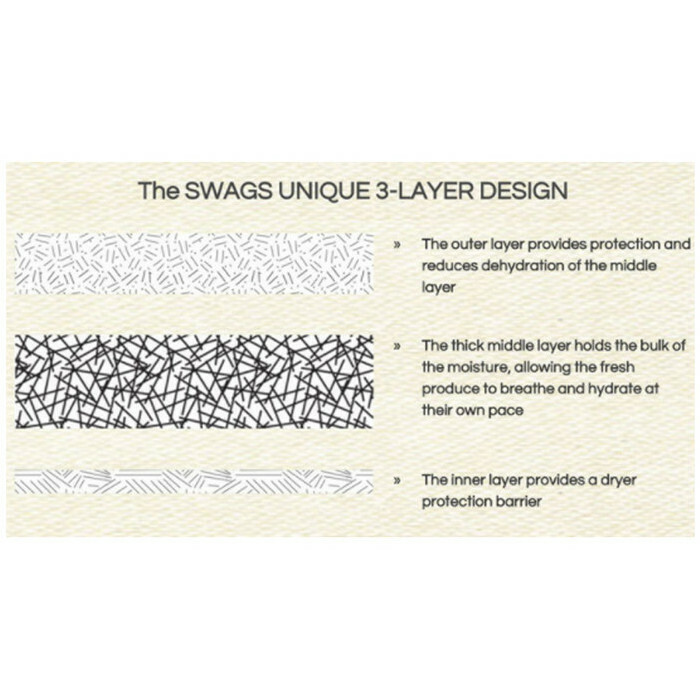 * Sway International Pty Ltd/Trading as The Swag has an International Patent Pending, Australian Patent No. 2015221423. 100% natural, unbleached, unseeded cotton materials. Non-toxic and non-allergenic. 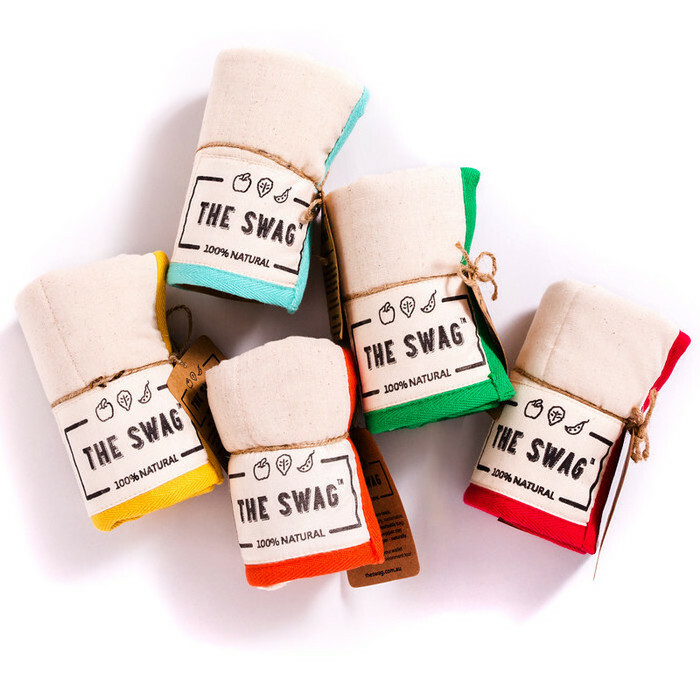 PREP: Wash and dry your Swag before first use. Make sure you dampen your Swag from the outside layer only and wring out excess water. 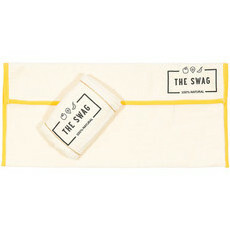 The inside of the Swag should be dry in parts and not noticeably wet. Dampen the outer layer when you feel it is dry. RIPENING: As a rule, only put UNRIPENED fruit in The Swag and as needed, move the UNRIPENED fruit from The Swag into your fruit bowl for a day or two and these fruits will be perfectly ripened. Leave out bananas or ripened fruit. ROOT VEGETABLES: Place root vegetables (i.e. potatoes, onions and ginger) into a dry Swag. WASHING: Machine washable. Wash as needed, or once every two weeks. Use the most natural washing powder you can find. Wash on a cold gentle wash for the very best results. 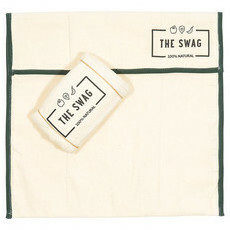 Put an extra rinse cycle on for your Swags to remove all soap residue. Dry in direct sunlight whilst turned inside out for a natural sterilisation process. Wash every 2 weeks to ensure they stay fresh. It's a good idea to have a few on the go so you always have a clean one ready to use to put your fresh produce in. I'm finding it difficult to get into the habit of using mine. When I use it, I don't really see a difference in the freshness of my vegetables. Have only used it for root vegetables but it has definitely worked. Prolongs freshness for weeks. I struggle with mine. Not a fan. The old long Tupperware celery crisper does a better job. Eeek I know.....plastic!